Microsoft has announced new hardware in the form of its first all-in-one PC. The Surface Studio is essentially an iMac (but better), and aimed at people with lots of money to spare. This is an absolutely beautiful device, but then it should be when prices start at $2,999. If you a) haven’t got $3,000 to spend on a PC, and b) don’t create stuff on a computer, you can stop reading now. Simply put, the Surface Studio is not for you. Don’t be disheartened, as it’s not for me either; I’m writing this on a Chromebook Make an Easy Switch to Chromebook Now (and Never Look Back) Make an Easy Switch to Chromebook Now (and Never Look Back) I've adopted, studied every Windows OS, adapted, and eventually learned to love each of them for different reasons. Are you curious to know why as of today, I'm a Chromebook guy? Read More that costs 20 times less than Microsoft’s new all-in-one. 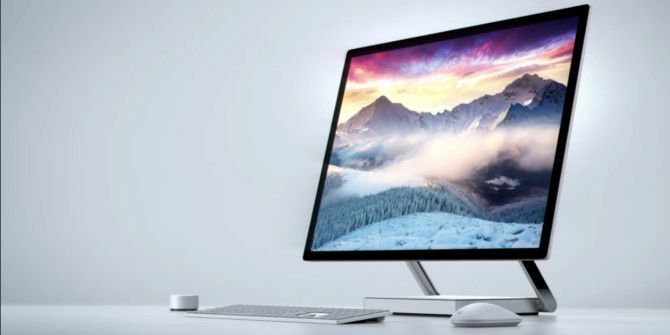 The Surface Studio is a gorgeous 28-inch all-in-one PC aimed at creative professionals. In particular, this has been crafted with digital artists in mind, with Microsoft clearly setting out to create the ultimate tool for people who specialize in art and design. Hence the “Studio”. The main draw is the “zero-gravity hinge” which lets you fold the display down flat using just one finger. Thus, the Surface Studio quickly turns from an upright desktop PC into a flat digital workspace. Hence the “Surface”. The LCD touchscreen display is, according to Microsoft, the thinnest monitor ever made. It offers a 3:2 display ratio, and 13.5 million pixels for a 192 PPI density. Creatives can utilize the Surface Pen, as well as a new puck-shaped peripheral called the Surface Dial. The latter can even be placed on the screen to add contextual options. The Surface Studio comes in three different flavors: The first offers an Intel Core i5 processor, 8GB of RAM, and a 1TB hard drive for $2999. The second offers an Intel Core i7 processor, 16GB of RAM, and a 2TB hard drive for $3499. And the third offers an Intel Core i7 processor, 32GB of RAM, and a 2TB hard drive for $4199. So, these aren’t cheap. Instead, they’re premium devices aimed at those who need the right tools to do their job. Microsoft is clearly, and cleverly, aiming the Surface Studio at those people who buy iMacs and other high-end Apple products 5 Ways to Save Money When Buying a MacBook 5 Ways to Save Money When Buying a MacBook Looking to get a MacBook for cheap? Here are some useful tips for saving the most money when you buy a Mac laptop. Read More out of habit. The idea being to disrupt that habit. What do you think of the Surface Studio? Do you do the kind of job which means you can justify buying one of these? What’s your opinion on the price? What’s the most you have ever spent on a computer? Please let us know in the comments below! Explore more about: PC, Windows, Windows 10. I chose DELL XPS over iMac, simple things like DVD capability. This is 30% more expensive for the i7 and as I am not the talented artist as illustrated (or illustrating) in the video, I can't see me moving to this. "Buying an iMac-Beater Isn’t Cheap" Actually it's quite cheap and easy to find too. That depends on your idea of an iMac-beater, I guess. Better hardware and software is a beater.